Lubrication-related equipment failure is a problem that plagues industrial facilities of all sizes and stripes. By some estimates, it causes as much as $1 trillion a year in reactive maintenance, unplanned downtime and lost productivity across the United States. These failure rates associated with lubrication also haven’t budged in the past two decades. This is especially troubling for industrial operators who have sunk billions of dollars into sophisticated maintenance management systems and predictive maintenance tools designed specifically to reduce downtime. Still, the problem is not getting better. How can that be? A small but growing number of reliability engineers think they have found an answer. They are rediscovering the value of returning to the basics and are applying innovative technology to old-school preventive maintenance. Yes, you read that right. It turns out that the newest weapon in the fight against machine failure isn’t new at all, but it works. It is also generating substantial savings along the way. Benjamin Franklin had it right more than two centuries ago with his adage, “An ounce of prevention is worth a pound of cure.” While this wisdom is indisputable, it’s astonishing how often it is ignored. For instance, take the medical field. In Seattle during the 1970s, residents used to brag that it was the safest city in which to have a heart attack. Thanks to a program called Medic One, someone having a heart attack could expect to be in treatment within 15 minutes or less. The program indeed saved many lives. The problem was that it was reactive in nature. Doctors intervened only after someone had suffered a heart attack. Since then, of course, the medical community has embraced the wisdom of taking preventive measures to reduce the risk of heart attacks in the first place. We now know to take precautionary steps such as exercising, eating right, not smoking, etc. In many ways, plant maintenance today is where medicine was in the 1970s. The tools are more advanced than ever, but they reflect a reactive mindset. Consider where advertising dollars have gone. For the past two decades, the focus in maintenance magazines, websites and trade shows has increasingly shifted from maintenance management solutions, such as computerized maintenance management systems (CMMS), to predictive maintenance and condition monitoring products. Make no mistake, tools like vibration analysis, infrared thermography and other technologies play a vital role in diagnosing problems early to reduce the impact of downtime. Yet, much like Seattle’s Medic One, they are truly useful only after the signs of failure have begun to appear. They are fundamentally reactive in nature. With so much emphasis on the efforts to detect failure, it begs the question: What about preventing machine failure from occurring to begin with? To eliminate bearing failure, you must first identify the cause. On that score, most experts are already in agreement, and have been for decades, that poor or inadequate lubrication is the primary cause of industrial equipment wear and failure. In 1995, an assessment provided during an engineering conference placed the figure at 54 percent. In 2014, Ken Bannister’s “State of the Lubrication Nation” revised the percentage to 70 percent. 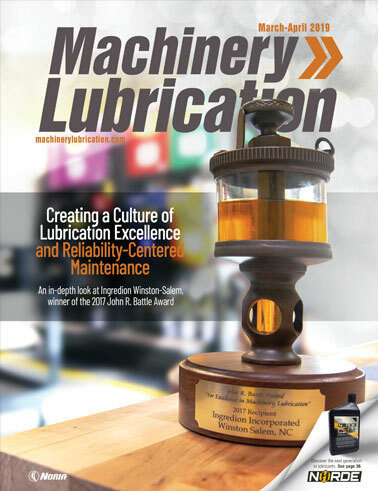 Bannister further calculated U.S. losses from lubrication-​related issues to be an eye-opening $1 trillion annually. Estimates vary, but it’s clear that the number of lube-related machine failures is far too high. 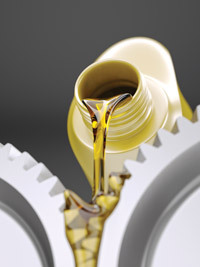 There are many reasons why lubrication problems are so persistent. A look at a few key statistics tells part of the story: Only 12 percent of those assigned lubrication duties are certified to do so. Seventy-nine percent of companies do not have a professionally audited lubrication program. Sixty-one percent of companies do not track lubrication-related failures. 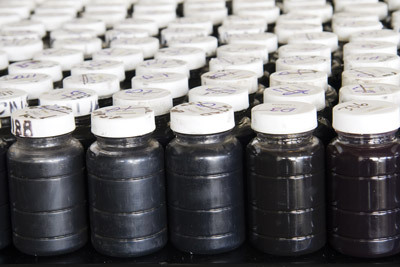 Fifty-seven percent do not perform system checks on automated lubricant-delivery systems. Ninety-one percent do not have lubricant requirement sheets for bearings. Increasingly, reliability engineers are beginning to recognize the role that inadequate lubrication plays in unplanned downtime and equipment failure. 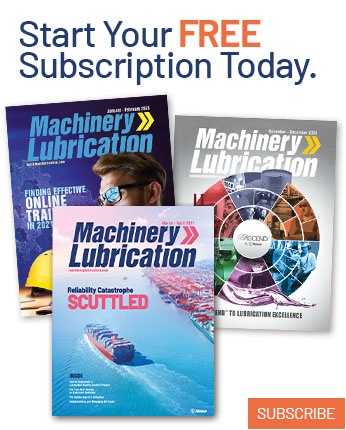 In an online survey by Machinery Lubrication, nearly 80 percent of reliability engineers indicated they experience lubricant starvation. In a live poll during a recent online maintenance conference, more than 85 percent of respondents made a correlation between lubrication issues and the level of reactive maintenance. Lubrication shortcomings result in repeated equipment failures, production losses, subpar technician productivity, excessive energy usage, increased lube consumption, negative environmental impacts and a state of perpetual catching up. While a growing number of reliability engineers understand the importance of proper lubrication in a plant’s efficiency, awareness at the management level is often lacking. In many organizations, management believes lubrication is just like any other maintenance task. However, as reliability engineers and lube technicians have known for years, lubrication is a highly specialized discipline. In fact, it is so complex that the International Council for Machinery Lubrication (ICML) offers numerous certifications for it. To get an idea of the many intricacies that lubrication entails, consider all the factors just to determine lube requirements. This generally involves five core data elements: components, lubricants, task types, procedures and frequencies. It could take seven different combinations of these elements to define lube requirements for a single conveyor and anywhere from 100-200 combinations across a plant. In addition, it is not unusual for industrial plants to have many thousands of lube points. Depending on the number, they may require between 70,000 to 500,000 individual lubrication tasks each year, with each task incorporating specific combinations of data elements. The logistical implications are overwhelming. A key reason lubrication problems remain so pervasive is that most industrial outfits attempt to manage lubrication using CMMS or enterprise asset management (EAM) solutions. Not only are these tools not designed to handle lubrication’s formidable complexity, but they often involve the use of cumbersome preventive maintenance (PM) work orders that are difficult and time-consuming to create. PM-based solutions are not capable of verifying that individual lube tasks are actually performed. Unlike corrective work orders, which can capture task completion more granularly, most lubrication work orders generated by CMMS and EAM systems are set up on an all or nothing basis. They can’t be closed until 100 percent of the tasks are completed. A typical lube work order may contain more than a hundred individual tasks. If lube techs are unable to complete a handful of work orders for whatever reason, there is no easy way to note that in the work order. Instead, the technicians have only two choices. They can choose to leave the entire work order open, even though most of the tasks have been completed, or they can check off everything as complete and hope the few missed tasks are covered next time. You can guess which option the vast majority of lube techs and maintenance managers prefer. This is how lube tasks routinely fall through the cracks. It happens far more often than most maintenance organizations realize. We know this to be true by the results companies have seen when using special software designed to track lube task completion and improve the efficiency of lube sequencing routes. Plants that rely on this type of software have achieved task completion rates of 80 to 95 percent. Keep in mind that to get such results, these organizations made a concerted effort to manage lubrication properly and still failed to complete 5 to 20 percent of their lube tasks. It is anyone’s guess how much higher this rate might be for facilities not currently tracking their task completion. However, one thing is certain: Lube-related bearing failures continue unabated across industries. Against this backdrop of futility, a back-to-basics movement is beginning to take hold. Think of it as an old-school approach with a new technology twist. It is originating on plant floors, not in corner offices, and is driven by reliability engineers and lube techs who recognize that diagnostic systems and CMMS tools alone are not enough to make a real difference in reactive maintenance and lube-related failures. Not surprisingly, you again find the first hints of this trend in advertising. 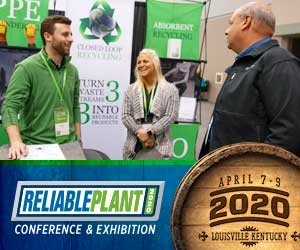 Recently, more advertisements and trade-show displays have been featuring desiccant breathers, sight glasses, contamination control solutions, ultrasonic grease guns and lube room sanitation systems. Although these are technically advanced products, they are proactive at their core. They indicate a rising demand for preventive measures. Add lubrication-specific training to increase your staff’s knowledge and establish best practices. Acquire lubrication-specific tools your staff may be lacking. Improve lubrication logistics and control. The increased accuracy, effectiveness and efficiency of a best-practice lube program can improve uptime, reduce costs and lift the bottom line. For example, one plant that took the needed steps pocketed $680,000 in savings. 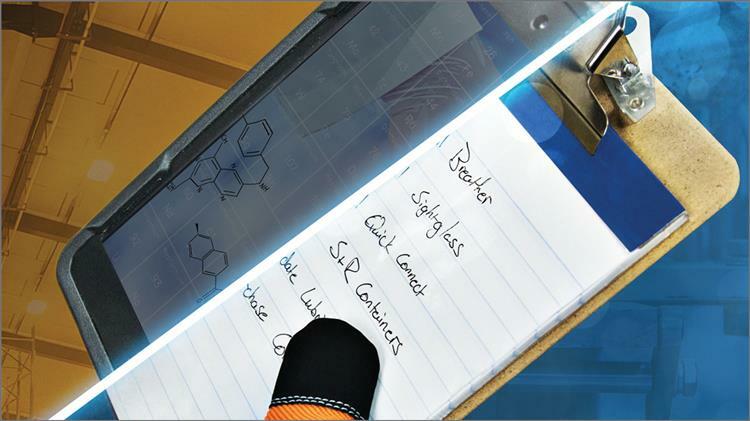 In this case, lubrication best practices were first studied, and a plan designed. Buy-in was then obtained from management down to the lube tech. Key certifications were attained in lubrication maintenance, and not just for lube techs but for supervisors and managers as well. 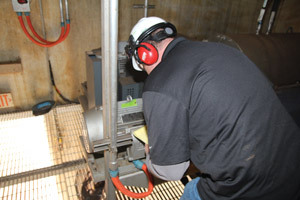 The plant also conducted a lubrication survey in which every lube point was identified. This provided a critical baseline on which to build the program. Then the lube room was organized. Lubricants would now be filtered as they were received from suppliers and again before application to the equipment. Next, an investment was made in color-coded containers to eliminate mistakes. Sealed oil containers were acquired to keep lubricants clean. Clear grease guns, sight glasses, breathers, filtration and contamination control were also incorporated. Finally, lubrication software was added to help establish efficient routes, schedules, responsibilities and accountability. While the plant had only 1,350 lube points, it managed to save $200,000 the first year and more than $160,000 per year during the next three years for a total of $680,000. If you were to extract this $200,000 savings over 1,350 lube points, it would equal a savings of $148 per lube point. Depending on the size of the plant, the savings would add up as follows: $740,000 for 5,000 lube points, $1.48 million for 10,000 lube points, and $2.2 million for 15,000 lube points. Advanced CMMS, predictive maintenance and condition monitoring solutions are essential to modern plant health and efficiency, but when it comes to making significant inroads in eliminating equipment downtime and failure, they leave much to be desired. Moreover, CMMS tools lack the control needed for the complexities of effective lubrication management. The rise of advanced preventive maintenance tools and best practices is a response to a challenging problem decades in the making. Sometimes the best way forward is to reach back. Today’s proactive preventive measures combine the wisdom of a back-to-basics approach with breakthrough technologies. Organizations that incorporate them into their maintenance programs stand to make substantial gains in equipment uptime, productivity and cumulative cost savings across the board. Bill Correll is the director of business development for Generation Systems Inc. He can be reached via email at billc@generationsystems.com.